Haptic Fader workshop with Alexandros Kontogeorgakopoulos. Haptic Fader is a force-feedback sliding potentiometer which offers a way of integrating the sense of touch into digital musical instruments and a more organic connection with electronic sound equipment. After years of academic and artistic research, the haptic fader was designed and developed for introducing musicians, sound artists, media artists, and interaction designers to haptics, a field which only very few institutions had access to before. 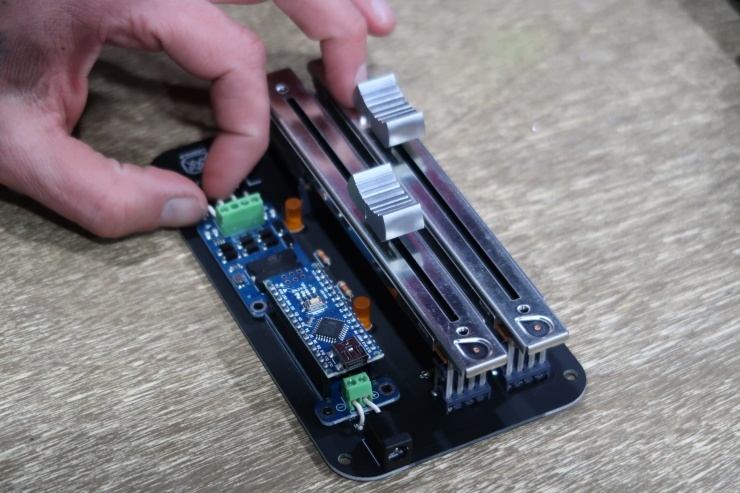 It is the only general-purpose cost-effective force-feedback device based on open-source hardware and open-source software elements for creative communities. Dr. Edgar Berdahl and Dr. Alexandros Kontogeorgakopoulos, creators of the device and framework, have held talks and workshops on international conferences, Universities and for wider audiences such us at the Ableton’s Loop festival. Over the years, different versions of the device have been used in compositions and audio-visual performances in the US and Europe. In the workshop, participants will assemble a haptic fader and learn how to program simple force-feedback haptic interactions in the visual programming environments of Max and Pure Data. The participants are not expected to have prior experience in electronics and digital fabrication. Some experience in programming is helpful, but not required. The participants should bring their own laptop to program the device, and pre-install Max (free for 30 days) and Pure Data. Alexandros Kontogeorgakopoulos is an academic, musician and artist, conducting transdisciplinary research and creating work at the intersection of art, science, and technology. He has equally a scientific, engineering and musical background which is reflected in the nature of his creative practice and his techno-scientific exploration. After completing his Ph.D. in 2008 in France, he joined Cardiff School of Art and Design (CSAD) at Cardiff Metropolitan University where he is currently Senior Lecturer in Sound and Media Art. His artistic work, which includes audiovisual performances, installations, and compositions, has been presented in Europe and in the US. As an artist/researcher he often develops his own software and hardware and explores novel technical, conceptual and artistic approaches. He is currently partner coordinator of the EU funded EASTN-DC European Art Science Technology Network - Digital Creativity project. He is also co-founder of stiwdioEverywhere, an art & design studio that travels around the world following the digital nomad's lifestyle, and oneContinuousLab, a transdisciplinary art-science studio-lab based in Athens, Greece. The participation fee for the workshop is 60 € and needs to be settled before the start of the workshop on-site. The fee covers expenses for materials, the workshop product remains in your possession. The workshop will be held in English. The number of participants is limited, so please apply/announce yourself at delavnica@ljudmila.org. The educational programme Ljudmila - the Laboratory for Science and Art is supported by the Slovene Ministry of Culture (in the co-production with Zavod Projekt Atol), MOL – Department for Culture and the EASTN-DC Network, which is co-funded by the Creative Europe programme of the European Union.